Individual prices for resellers. 9in/10out standalone EoC (Ethernet over Coax) multiswitch for distribution of 8 SAT IF signals including UHF band for up to 10 users. External data link 1 Gbit/s (RJ45) (1000BASE-TX), 10 coaxial links 100 Mbit/s (100BASE-TX). Power supply PA12 2A is included in the package. For use only with EMP-Centauri NET CLASS NS01 wall sockets! EoC enabled end wall socket, outputs SAT+TV+2xRJ45, 100Mbit/sec. Are designed for the distribution of terrestrial and satellite signals along with data connectivity. Main features of NET CLASS EoC multiswitches. Support for Quattro LNB. Active terrestrial input covers splitting losses. Data link 100 Mbit/s over user coaxial cable. External power supply (included in the package). Maximum length of coaxial cable from multiswitch to NS01 wall socket is 100 meters. For indoor use only. HDTV and UHDTV compatible. Control of SAT TV. DiSEqC 1.0 (2.0) commands. Dimensions (w, d, h). 18.6 x 14.6 x 5.1 cm. [dBµV]; SAT: EN 50083-3/35dB IMA. Multiswitches are controlled by receiver using analog and DiSEqC 1.0 commands. Command sent by receiver. 13 V, 0 kHz, DiSEqC A (1). 18 V, 0 kHz, DiSEqC A (1). 13 V, 22 kHz, DiSEqC A (1). 18 V, 22 kHz, DiSEqC A (1). 13 V, 0 kHz, DiSEqC B (2). 18 V, 0 kHz, DiSEqC B (2). 13 V, 22 kHz, DiSEqC B (2). 18 V, 22 kHz, DiSEqC B (2). Multiswitches are not compatible with Monoblock LNBs. The AC/DC adapter PA12 is ideal for use with antenna devices like amplifiers, multiswitches, in communications, industrial automation etc. Protection: Shortage Protection, Overload Protection, Over Voltage Protection. Shell Material: Metal case / Aluminium base. 90-265 V AC, 50/60 Hz. 16 x 6.4 x 5 cm. We represent that the goods are as they are described in the above listing. We must be advised of any faulty goods within 30 days of receipt. W e believe the information on this page to be accurate; such information is subject to change without notice. We are not responsible for any inadvertent errors. We pride ourselves on our customer service. We are here to assist you between 07:00 to 17:00 weekdays. +420 376 323 853, +420 376 323 813 (during workhours). 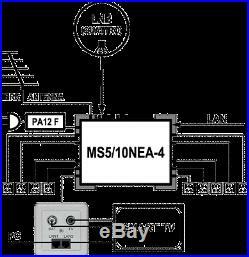 The item “Ethernet over Coax satellite multiswitch MS9/10NEA-4 (9×10), 1Gbps, Made in EU” is in sale since Saturday, November 12, 2016. 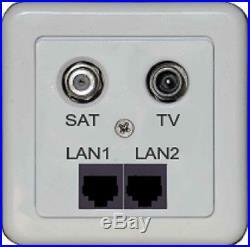 This item is in the category “Computers/Tablets & Networking\Home Networking & Connectivity\Other Home Networking”. The seller is “sattvnoone” and is located in Klatovy, default. This item can be shipped worldwide. Individual prices for resellers. 17in/10out standalone EoC (Ethernet over Coax) multiswitch for distribution of 16 SAT IF signals including UHF band for up to 10 users. External data link 1 Gbit/s (RJ45) (1000BASE-TX), 10 coaxial links 100 Mbit/s (100BASE-TX). Power supply PA12 2A is included in the package. For use only with EMP-Centauri NET CLASS NS01 wall sockets! EoC enabled end wall socket, outputs SAT+TV+2xRJ45, 100Mbit/sec. Are designed for the distribution of terrestrial and satellite signals along with data connectivity. Main features of NET CLASS EoC multiswitches. Support for Quattro LNB. Active terrestrial input covers splitting losses. Data link 100 Mbit/s over user coaxial cable. Maximum length of coaxial cable from multiswitch to the wall socket is 100 meters. External power supply (included in the package). For indoor use only. HDTV and UHDTV compatible. DiSEqC 1.0 (2.0) commands. Dimensions (w, d, h). 18.6 x 14.6 x 5.1 cm. [dBµV]; SAT: EN 50083-3/35dB IMA. 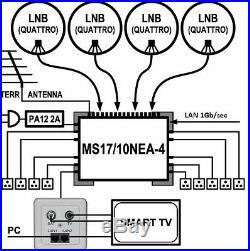 Multiswitches are controlled by satellite receiver using analog and DiSEqC 1.0 commands. Command sent by receiver. 13 V, 0 kHz, DiSEqC A (1). 18 V, 0 kHz, DiSEqC A (1). 13 V, 22 kHz, DiSEqC A (1). 18 V, 22 kHz, DiSEqC A (1). 13 V, 0 kHz, DiSEqC B (2). 18 V, 0 kHz, DiSEqC B (2). 13 V, 22 kHz, DiSEqC B (2). 18 V, 22 kHz, DiSEqC B (2). 13 V, 0 kHz, DiSEqC C (2). 18 V, 0 kHz, DiSEqC C (2). 13 V, 22 kHz, DiSEqC C (2). 18 V, 22 kHz, DiSEqC C (2). 13 V, 0 kHz, DiSEqC D (2). 18 V, 0 kHz, DiSEqC D (2). 13 V, 22 kHz, DiSEqC D (2). 18 V, 22 kHz, DiSEqC D (2). Multiswitches are not compatible with Monoblock LNBs. The AC/DC adapter PA12 is ideal for use with antenna devices like amplifiers, multiswitches, in communications, industrial automation etc. Protection: Shortage Protection, Overload Protection, Over Voltage Protection. Shell Material: Metal case / Aluminium base. 90-265 V AC, 50/60 Hz. 16 x 6.4 x 5 cm. We represent that the goods are as they are described in the above listing. We must be advised of any faulty goods within 30 days of receipt. W e believe the information on this page to be accurate; such information is subject to change without notice. We are not responsible for any inadvertent errors. We pride ourselves on our customer service. We are here to assist you between 07:00 to 17:00 weekdays. +420 376 323 853, +420 376 323 813 (during workhours). The item “Ethernet over Coax satellite multiswitch MS17/10NEA-4 (17×10), 1Gbps, Made in EU” is in sale since Saturday, November 12, 2016. This item is in the category “Computers/Tablets & Networking\Home Networking & Connectivity\Other Home Networking”. The seller is “sattvnoone” and is located in Klatovy, default. This item can be shipped worldwide. Individual prices for resellers. A complete system of satellite TV, terrestrial TV and fast Ethernet (100 Base TX for each user connected) distribution for 10 connected households to one antenna system in a house. 17in/10out standalone EoC (Ethernet over Coax) multiswitch for distribution of 16 SAT IF signals including UHF band for up to 10 users. 10 pcs of wall sockets NS01-S1. External power supply unit PA12. External data link 1 Gbit/s (RJ45) (1000BASE-TX), 10 coaxial links 100 Mbit/s (100BASE-TX). For use only with EMP-Centauri NET CLASS NS01 wall sockets! 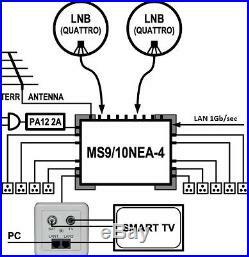 EoC enabled end wall socket, outputs SAT+TV+2xRJ45, 100Mbit/sec. 10 pcs of sockets included in the package. Are designed for the distribution of terrestrial and satellite signals along with data connectivity. Main features of NET CLASS EoC multiswitches. Support for Quattro LNB. Active terrestrial input covers splitting losses. Data link 100 Mbit/s over user coaxial cable. Maximum length of coaxial cable from multiswitch to the wall socket is 100 meters. External power supply unit (included in the package). For indoor use only. HDTV and UHDTV compatible. Control of SAT TV. DiSEqC 1.0 (2.0) commands. Dimensions (w, d, h). 18.6 x 14.6 x 5.1 cm. [dBµV]; SAT: EN 50083-3/35dB IMA. Multiswitches are controlled by receiver using analog and DiSEqC 1.0 commands. Command sent by receiver. 13 V, 0 kHz, DiSEqC A (1). 18 V, 0 kHz, DiSEqC A (1). 13 V, 22 kHz, DiSEqC A (1). 18 V, 22 kHz, DiSEqC A (1). 13 V, 0 kHz, DiSEqC B (2). 18 V, 0 kHz, DiSEqC B (2). 13 V, 22 kHz, DiSEqC B (2). 18 V, 22 kHz, DiSEqC B (2). 13 V, 0 kHz, DiSEqC C (2). 18 V, 0 kHz, DiSEqC C (2). 13 V, 22 kHz, DiSEqC C (2). 18 V, 22 kHz, DiSEqC C (2). 13 V, 0 kHz, DiSEqC D (2). 18 V, 0 kHz, DiSEqC D (2). 13 V, 22 kHz, DiSEqC D (2). 18 V, 22 kHz, DiSEqC D (2). Multiswitches are not compatible with Monoblock LNBs. The AC/DC adapter PA12 is ideal for use with antenna devices like amplifiers, multiswitches, in communications, industrial automation etc. Protection: Shortage Protection, Overload Protection, Over Voltage Protection. Shell Material: Metal case / Aluminium base. 90-265 V AC, 50/60 Hz. 16 x 6.4 x 5 cm. We represent that the goods are as they are described in the above listing. We must be advised of any faulty goods within 30 days of receipt. W e believe the information on this page to be accurate; such information is subject to change without notice. We are not responsible for any inadvertent errors. We pride ourselves on our customer service. We are here to assist you between 07:00 to 17:00 weekdays. +420 376 323 853, +420 376 323 813 (during workhours). The item “Ethernet over Coax multiswitch, COMPLETE SYSTEM for 4 satellites, 10 users, 1Gbps” is in sale since Sunday, November 13, 2016. 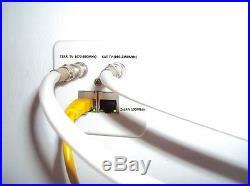 This item is in the category “Computers/Tablets & Networking\Home Networking & Connectivity\Wired Routers”. The seller is “sattvnoone” and is located in Klatovy, default. This item can be shipped worldwide. Individual prices for resellers. 5in/10out standalone EoC (Ethernet over Coax) multiswitch for distribution of 4 SAT IF signals including UHF band for up to 10 users. External data link 1 Gbit/s (RJ45) (1000BASE-TX), 10 coaxial links 100 Mbit/s (100BASE-TX). Power supply PA12 2A is included in the package. For use only with EMP-Centauri NET CLASS NS01 wall sockets! EoC enabled end wall socket, outputs SAT+TV+2xRJ45, 100Mbit/sec. Are designed for the distribution of terrestrial and satellite signals along with data connectivity. Main features of NET CLASS EoC multiswitches. Support for Quattro LNB. Active terrestrial input covers splitting losses. Data link 100 Mbit/s over user coaxial cable. External power supply (included in the package). Maximum length of coaxial cable from multiswitch to NS01 wall socket is 100 meters. For indoor use only. HDTV and UHDTV compatible. Control of SAT TV. 13/17V and 0/22kHz commads. Dimensions (w, d, h). 18.6 x 14.6 x 5.1 cm. [dBµV]; SAT: EN 50083-3/35dB IMA. Multiswitches are controlled by satellite receiver using analog commands. Command sent by receiver. 13 V, 0 kHz. 18 V, 0 kHz. 13 V, 22 kHz. 18 V, 22 kHz. Multiswitches are not compatible with Monoblock LNBs. The AC/DC adapter PA12 is ideal for use with antenna devices like amplifiers, multiswitches, in communications, industrial automation etc. Protection: Shortage Protection, Overload Protection, Over Voltage Protection. Shell Material: Metal case / Aluminium base. 90-265 V AC, 50/60 Hz. 16 x 6.4 x 5 cm. We represent that the goods are as they are described in the above listing. We must be advised of any faulty goods within 30 days of receipt. W e believe the information on this page to be accurate; such information is subject to change without notice. We are not responsible for any inadvertent errors. We pride ourselves on our customer service. We are here to assist you between 07:00 to 17:00 weekdays. +420 376 323 853, +420 376 323 813 (during workhours). The item “Ethernet over Coax satellite multiswitch MS5/10NEA-4 (5×10), 1Gbps, Made in EU” is in sale since Saturday, November 12, 2016. This item is in the category “Computers/Tablets & Networking\Home Networking & Connectivity\Other Home Networking”. The seller is “sattvnoone” and is located in Klatovy, default. This item can be shipped worldwide. Individual prices for resellers. 9in/10out standalone EoC (Ethernet over Coax) multiswitch for distribution of 8 SAT IF signals including UHF band for up to 10 users. External data link 1 Gbit/s (RJ45) (1000BASE-TX), 10 coaxial links 100 Mbit/s (100BASE-TX). Power supply PA12 2A is included in the package. For use only with EMP-Centauri NET CLASS NS01 wall sockets! 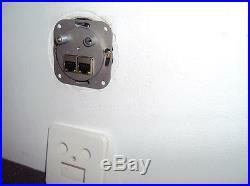 EoC enabled end wall socket, outputs SAT+TV+2xRJ45, 100Mbit/sec. Are designed for the distribution of terrestrial and satellite signals along with data connectivity. Main features of NET CLASS EoC multiswitches. Support for Quattro LNB. Active terrestrial input covers splitting losses. Data link 100 Mbit/s over user coaxial cable. External power supply (included in the package). Maximum length of coaxial cable from multiswitch to NS01 wall socket is 100 meters. For indoor use only. HDTV and UHDTV compatible. Control of SAT TV. DiSEqC 1.0 (2.0) commands. Dimensions (w, d, h). 18.6 x 14.6 x 5.1 cm. [dBµV]; SAT: EN 50083-3/35dB IMA. Multiswitches are controlled by receiver using analog and DiSEqC 1.0 commands. Command sent by receiver. 13 V, 0 kHz, DiSEqC A (1). 18 V, 0 kHz, DiSEqC A (1). 13 V, 22 kHz, DiSEqC A (1). 18 V, 22 kHz, DiSEqC A (1). 13 V, 0 kHz, DiSEqC B (2). 18 V, 0 kHz, DiSEqC B (2). 13 V, 22 kHz, DiSEqC B (2). 18 V, 22 kHz, DiSEqC B (2). Multiswitches are not compatible with Monoblock LNBs. The AC/DC adapter PA12 is ideal for use with antenna devices like amplifiers, multiswitches, in communications, industrial automation etc. Protection: Shortage Protection, Overload Protection, Over Voltage Protection. Shell Material: Metal case / Aluminium base. 90-265 V AC, 50/60 Hz. 16 x 6.4 x 5 cm. We represent that the goods are as they are described in the above listing. We must be advised of any faulty goods within 30 days of receipt. W e believe the information on this page to be accurate; such information is subject to change without notice. We are not responsible for any inadvertent errors. We pride ourselves on our customer service. We are here to assist you between 07:00 to 17:00 weekdays. +420 376 323 853, +420 376 323 813 (during workhours). The item “Ethernet over Coax satellite multiswitch MS9/10NEA-4 (9×10), 1Gbps, Made in EU” is in sale since Sunday, May 15, 2016. This item is in the category “Consumer Electronics\TV, Video & Home Audio\TV, Video & Audio Accessories\Satellite Signal Multiswitches”. The seller is “sattvnoone” and is located in Klatovy, default. This item can be shipped worldwide. Individual prices for resellers. 17in/10out standalone EoC (Ethernet over Coax) multiswitch for distribution of 16 SAT IF signals including UHF band for up to 10 users. External data link 1 Gbit/s (RJ45) (1000BASE-TX), 10 coaxial links 100 Mbit/s (100BASE-TX). Power supply PA12 2A is included in the package. 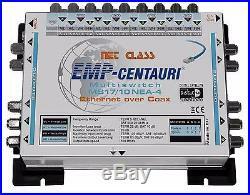 For use only with EMP-Centauri NET CLASS NS01 wall sockets! EoC enabled end wall socket, outputs SAT+TV+2xRJ45, 100Mbit/sec. Are designed for the distribution of terrestrial and satellite signals along with data connectivity. Main features of NET CLASS EoC multiswitches. Support for Quattro LNB. Active terrestrial input covers splitting losses. Data link 100 Mbit/s over user coaxial cable. Maximum length of coaxial cable from multiswitch to the wall socket is 100 meters. External power supply (included in the package). For indoor use only. HDTV and UHDTV compatible. DiSEqC 1.0 (2.0) commands. Dimensions (w, d, h). 18.6 x 14.6 x 5.1 cm. [dBµV]; SAT: EN 50083-3/35dB IMA. 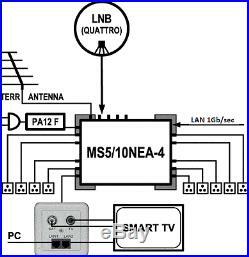 Multiswitches are controlled by satellite receiver using analog and DiSEqC 1.0 commands. Command sent by receiver. 13 V, 0 kHz, DiSEqC A (1). 18 V, 0 kHz, DiSEqC A (1). 13 V, 22 kHz, DiSEqC A (1). 18 V, 22 kHz, DiSEqC A (1). 13 V, 0 kHz, DiSEqC B (2). 18 V, 0 kHz, DiSEqC B (2). 13 V, 22 kHz, DiSEqC B (2). 18 V, 22 kHz, DiSEqC B (2). 13 V, 0 kHz, DiSEqC C (2). 18 V, 0 kHz, DiSEqC C (2). 13 V, 22 kHz, DiSEqC C (2). 18 V, 22 kHz, DiSEqC C (2). 13 V, 0 kHz, DiSEqC D (2). 18 V, 0 kHz, DiSEqC D (2). 13 V, 22 kHz, DiSEqC D (2). 18 V, 22 kHz, DiSEqC D (2). Multiswitches are not compatible with Monoblock LNBs. The AC/DC adapter PA12 is ideal for use with antenna devices like amplifiers, multiswitches, in communications, industrial automation etc. Protection: Shortage Protection, Overload Protection, Over Voltage Protection. Shell Material: Metal case / Aluminium base. 90-265 V AC, 50/60 Hz. 16 x 6.4 x 5 cm. We represent that the goods are as they are described in the above listing. We must be advised of any faulty goods within 30 days of receipt. W e believe the information on this page to be accurate; such information is subject to change without notice. We are not responsible for any inadvertent errors. We pride ourselves on our customer service. We are here to assist you between 07:00 to 17:00 weekdays. +420 376 323 853, +420 376 323 813 (during workhours). The item “Ethernet over Coax satellite multiswitch MS17/10NEA-4 (17×10), 1Gbps, Made in EU” is in sale since Sunday, May 15, 2016. This item is in the category “Consumer Electronics\TV, Video & Home Audio\TV, Video & Audio Accessories\Satellite Signal Multiswitches”. The seller is “sattvnoone” and is located in Klatovy, default. This item can be shipped worldwide. Individual prices for resellers. 5in/10out standalone EoC (Ethernet over Coax) multiswitch for distribution of 4 SAT IF signals including UHF band for up to 10 users. External data link 1 Gbit/s (RJ45), 10 coaxial links 100 Mbit/s. Power supply PA12 2A is included in the package. 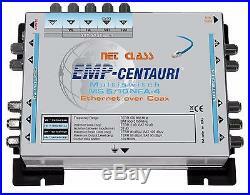 For use only with EMP-Centauri NET CLASS NS01 wall sockets! EoC enabled end wall socket, outputs SAT+TV+2xRJ45, 100Mbit/sec. Are designed for the distribution of terrestrial and satellite signals along with data connectivity. Main features of NET CLASS EoC multiswitches. Support for Quattro LNB. Active terrestrial input covers splitting losses. Data link 100 Mbit/s over user coaxial cable. External power supply (included in the package). Maximum length of coaxial cable from multiswitch to NS01 wall socket is 100 meters. For indoor use only. HDTV and UHDTV compatible. Control of SAT TV. 13/17V and 0/22kHz commads. Dimensions (w, d, h). 18.6 x 14.6 x 5.1 cm. [dBµV]; SAT: EN 50083-3/35dB IMA. Multiswitches are controlled by satellite receiver using analog commands. Command sent by receiver. 13 V, 0 kHz. 18 V, 0 kHz. 13 V, 22 kHz. 18 V, 22 kHz. Multiswitches are not compatible with Monoblock LNBs. The AC/DC adapter PA12 is ideal for use with antenna devices like amplifiers, multiswitches, in communications, industrial automation etc. Protection: Shortage Protection, Overload Protection, Over Voltage Protection. Shell Material: Metal case / Aluminium base. 90-265 V AC, 50/60 Hz. 16 x 6.4 x 5 cm. We represent that the goods are as they are described in the above listing. We must be advised of any faulty goods within 30 days of receipt. W e believe the information on this page to be accurate; such information is subject to change without notice. We are not responsible for any inadvertent errors. We pride ourselves on our customer service. We are here to assist you between 07:00 to 17:00 weekdays. +420 376 323 853, +420 376 323 813 (during workhours). The item “Ethernet over Coax satellite multiswitch MS5/10NEA-4 (5×10), 1Gbps, Made in EU” is in sale since Saturday, November 12, 2016. This item is in the category “Consumer Electronics\TV, Video & Home Audio\TV, Video & Audio Accessories\Satellite Signal Multiswitches”. 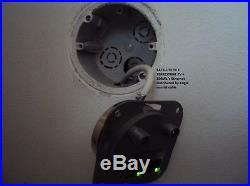 The seller is “sattvnoone” and is located in Klatovy, default. This item can be shipped worldwide.